A ‘Junior Heroes!’ themed Holiday Club Week was held from Monday 22nd until Friday 26th July in the Canon McCrea Hall, St Mary’s School, Carrigaline for children from the Carrigaline Union and Templebreedy Group of parishes. A great group of Teen Leaders from both parishes helped out for the week. The Rectors, the Revd Isobel Jackson and the Revd Elaine Murray, were delighted with the week which included a Teen Leaders’ night out on Tuesday and a Parents’ Night Concert on Thursday night. 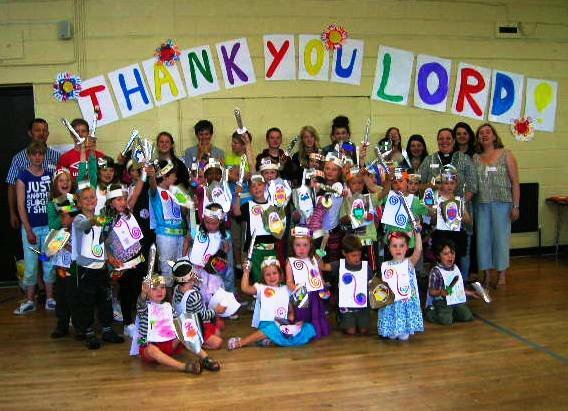 The 30 children who took part seemed to be very happy with the puppets, drama, art and crafts during the week and also about all they learned of the Junior Heroes in the Bible. They were already speaking about and looking forward to next year’s Club….the Adult and Teen Leaders seemed to be very glad that they have the next 51 weeks to recover their energy! This entry was posted in Children's Work, Parish News. Bookmark the permalink.